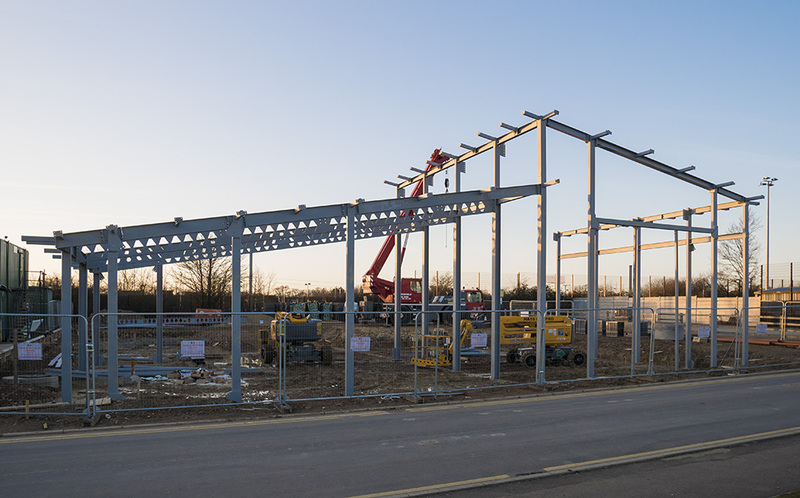 The building site at Kester Way now has something resembling a building – and it looks big! The right half (with a higher roof) will be the main hall. The left half will house the foyer, kitchen, meeting room, toilets and office, plus a pre-school facility that will be managed separately. Compare the photo above with the artist’s impression below and you can already see where the glass wall to the foyer seating area will be, plus the windows that encircle the hall just below the roof. No doubt there will be lots of milestones over the next few months, but this one feels particularly exciting. St Neots Town Council has pledged to support Love’s Farm House to the tune of £55,000. The money will be critical in helping us turn an empty building into a fully fledged community centre. £45,000 goes towards fixtures and fittings, including furniture, kitchen, office and IT equipment. The money will also be used to upgrade certain elements of the building’s specification, such as improving the quality of the flooring and installing additional power sockets and light fittings. There’s a further £10,000 for our pre-launch costs, including professional fees, licenses, deposits and starting inventory. The Council has also offered to contribute towards marketing and our launch festival, and to provide manpower for garden landscaping. It’s a tremendous show of support, and one that we feel reflects the Town Council’s commitment to supporting our community centre and Love’s Farm in general. We still have some further fundraising to do, but this generous funding means we can now be confident that we’ll be ready to take on the management of the building when construction is complete. We’d like to say a huge thank you to all the councillors and staff at St Neots Town Council for their support. Meanwhile, we have signed an agreement to lease with Huntingdonshire District Council, which ties both parties into entering into a 30-year lease once the building is complete. There’s no going back now!